If you like sweet, this is for you. Sweet milk chocolate, sweet honeycomb, together in a sweet little bee shape, this little box of deliciousness is going to be an extremely popular chocolate among kids and adults alike. I probably ate half the bag before I let the office at it, then ate another one as I left it for them to try. 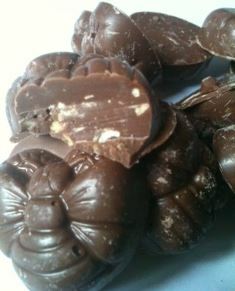 There are small bits of honeycomb inside a thick milk chocolate heart with a bee shape on top. I’m not sure if the heart was intentional or not (probably because this chocolate has an ethical heart) but it makes it extra cool. Of course, bees make honey and while that isn’t related to honeycomb, I love that play on words. The sweetness of this isn’t too high so even I who do not like too much sweetness was enjoying eating my way through these bees. 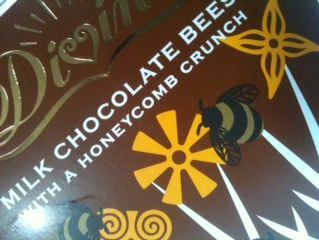 These milk chocolate with honeycomb bees are sure to be a big hit. They are made from Fairtrade chocolate, as well as other certified Fairtrade ingredients by a chocolate company which owns 45% if the company making the chocolate, the packaging is recyclable and the plastic is kept to a minimum. It’ll be difficult to buy a more ethical chocolaty treat in your supermarket. Remember that by choosing Divine, you aren’t just supporting the farmers through Fairtrade, you’re supporting the farmers through their ownership of the company. These are so cute and they sound really tasty. I might have to treat myself to a bag!